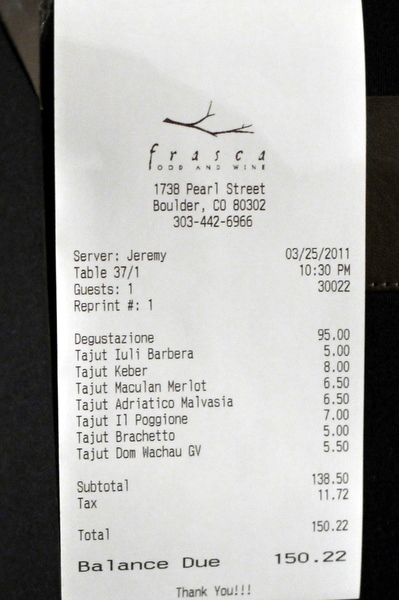 Boulder has a remarkable concentration of high end restaurants and Frasca is widely considered the best of the bunch. 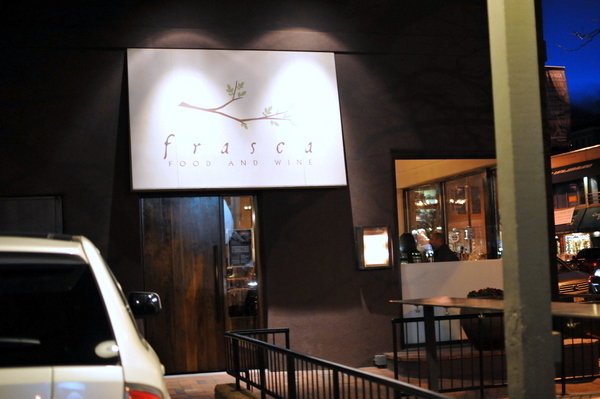 Winner of 5280's "Top 25 Restaurants in Denver," Frasca exudes a suave contemporary elegance mixed but the natural tones and heavy use of wood gives the place an inviting warmth and sense of rustic charm. 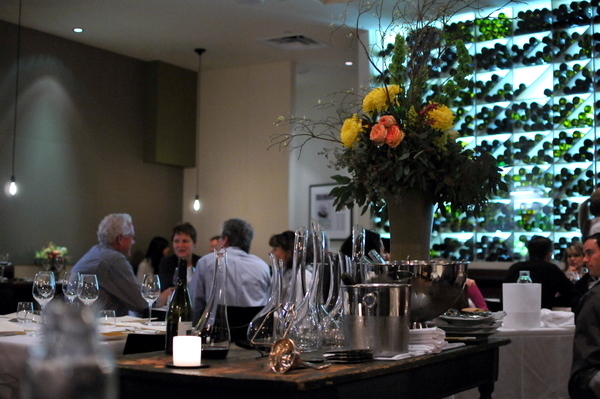 Frasca is the product of two French Laundry alums, Chef Lachlan Mackinnon-Patterson and Master Sommelier Bobby Stuckey. Chef Mackinnon-Patterson got his start at the Old Warson Country Club in St. Louis but quickly moved to Paris where he studied at the École Grégoire-Ferrandi. After earning his professional certification, he remained in France, working under well respected chefs at Jamin and La Taupiniere. His first job after coming back to the States was as a chef de partie at The French Laundry where he met his future business partner, then wine director, Bobby Stuckey and the two would open Frasca in 2003. Despite his training being predominantly classic French, his passion was for the cuisine of the Friuli-Venezia Giulia region in Italy. 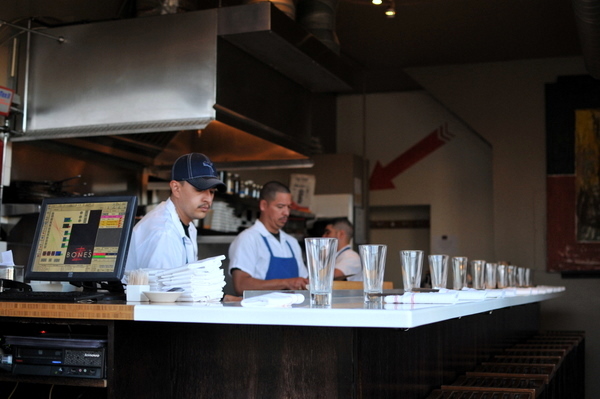 Since opening Frasca, Mackinnon-Patterson has won a James Beard award for Best Chef in the Southwest Region, earned a spot on Gayot's 2008 Top 40 Restaurants in the US, and even appeared on Top Chef Masters. His partner, Bobby Stuckey, has an equally impressive resume. After a five year stint at The Little Nell, he moved onto French Laundry where he was wine director from 2000 to 2003 and won the James Beard award for "Outstanding Wine Service." In 2004 Stuckey became one of fewer than 100 Master Sommeliers in the country and he was again nominated for another James Beard award in 2008, this time "Outstanding Wine and Spirits Professional." 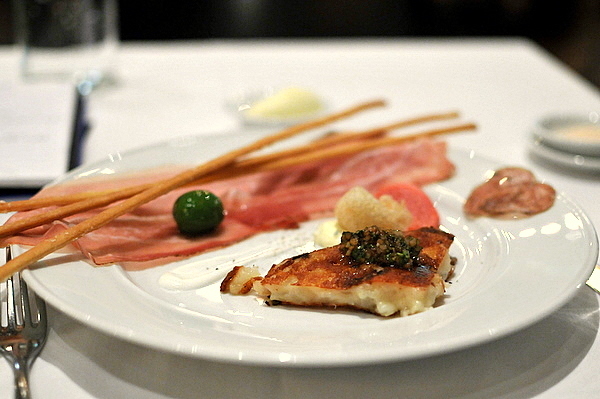 Salumi & Fritti Platter - Prosciutto di San Danelle, Speck, Salame alla Scarpetta, "Rafano" and "Grissini", Castelmango Olive, Pickled Watermelo Radish, "Gamberetti", and "Frico Caldo"
My server warned me to skip the Salumi and Fritti sections as they were putting together a complete tasting as a welcoming gift. The entire platter was delicious but there were a couple of standouts. 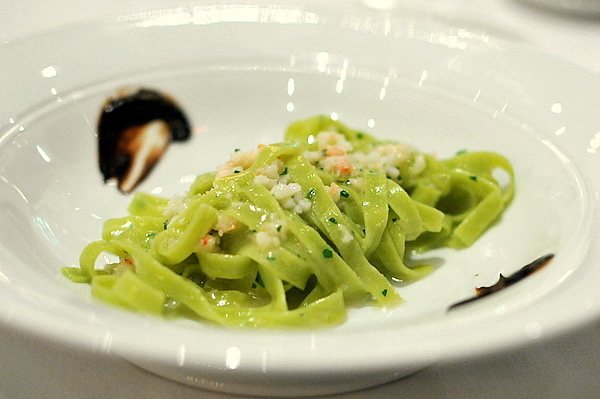 The Gaberetti was a true treat, served with an egg cornichon emulsion and remided me of a Filet o'Fish. 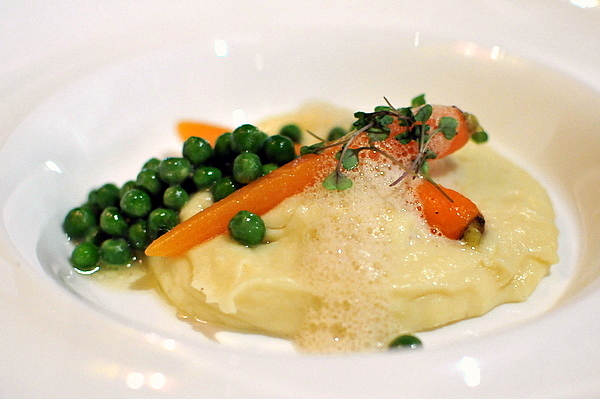 However star was the Frico Caldo, Frasca's take on the traditional Friuli cheese crisp. The restaurant blends rich melty cheese, crisp starchy potato and finished with a delightfully tangy shallot and cilantro vinaigrette. 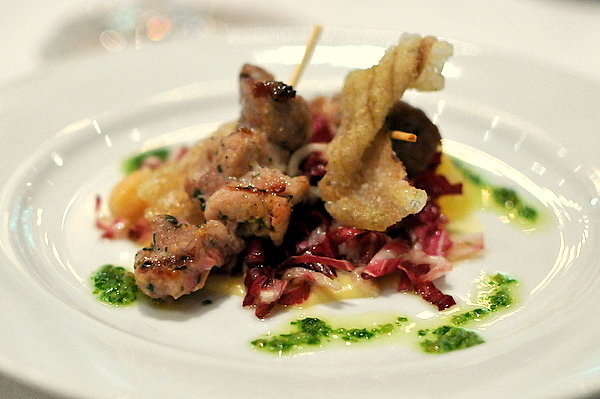 The wine was also a welcoming aperitivo that paired effectively with most of the things on the plate. 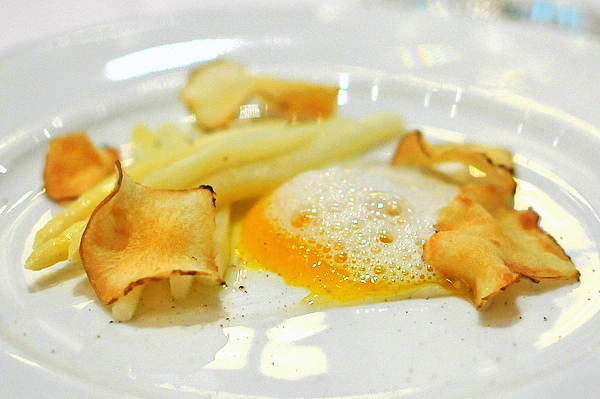 The spry crisp baby white asparagus grabs your attention with a fresh vegetal sweetness. The dish also displays some complexity and depth with delightfully salty chips and an earthy perfume courtesy of the truffle foam. The egg provides a lovely viscosity that ties the the whole dish together. The wine a typically bright Gruner Vetliner also possesses a vegetal astringency that matches well with the asparagus. The noodles derive their green color from the inclusion of leeks which also imparts a lovely firmness to the buttery noodles. The shrimp takes a backseat to the troika of garlic. The most impressive of the three was the poached garlic which was poached 7 times, the last in milk resulting in a tender mild creamy very pure yet restrained essence of garlic. This wine was from the Friuli, a blend of Friuliano and Malavisa as well as several other white grapes, the floral nose and viscous honeyed mouth feel masked a minerally core that heightened the briny flavor of the shrimp. This course just reads brilliantly on paper, lamb and mint are a classic pairing while the peas and mint produce a lovely freshness. 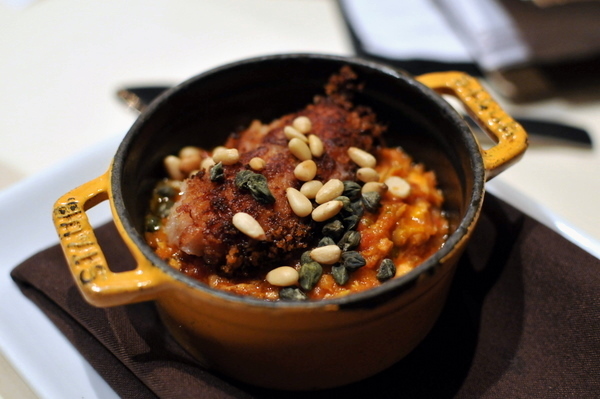 The dish was just as good as I imagined, the risotto was cooked in a chicken stock giving it an enveloping savoriness. 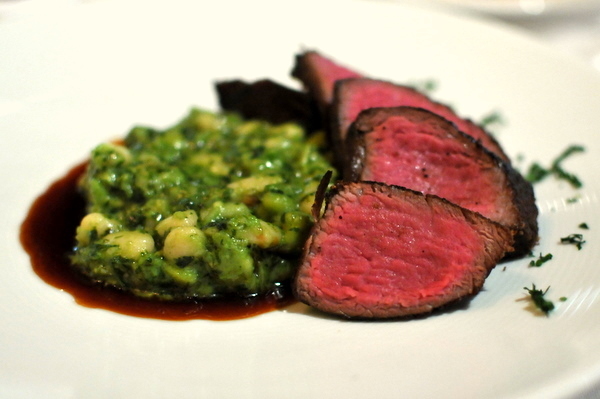 The lamb enhances the savoriness with a rustic gamy tang while the mint and peas add an airy intricacy. 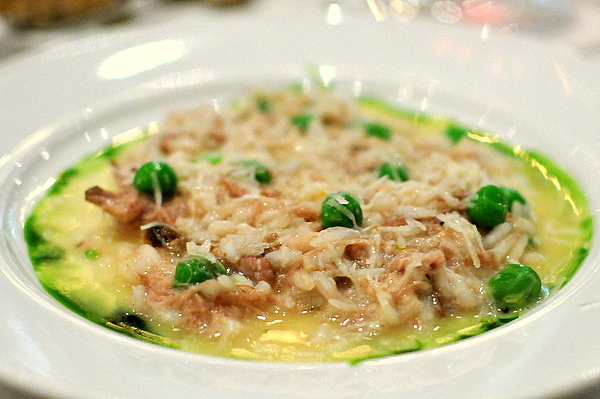 Texturally, the risotto was one of the best, plump and firm but not gritty. As for the wine, though the expressive red fruits are tinged with some herbal and floral notes, I thought the Bordeaux-style red blend was a bit heavy for the lamb though still quite good. Next up was a radiant silver-skin fish, moist with a delicate flakiness; the flavor was more robust than I was expecting from Sea Bream. 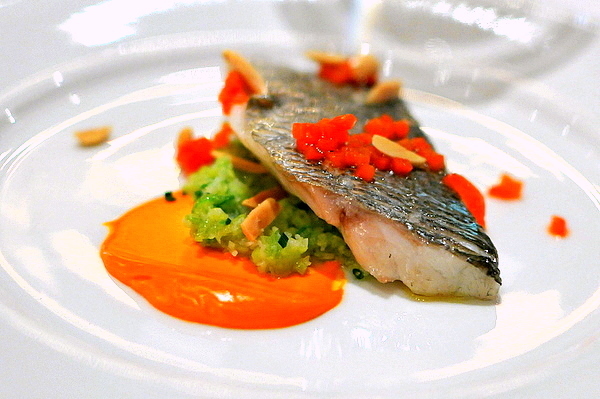 In the end the more assertive flavor of the fish matched up well to the heady red-pepper smoke of the Romesco. The wine was a bit heavy and viscous on its own but the flavors of Romesco and fish drew out the Adriatico's latent salinity and astringency. After the faultless Spiedino, the pork loin felt a bit flat, still moister and more flavorful than most, it lacked the complexity and overt richness of the skewers. The belly on the other hand was a small bite of heaven. Despite being ludicrously marbled, the belly wasn't overtly fatty and fit exquisitely with the bread dumplings. The wine was a rich 100% Sangiovese, juicy with a mouth filling lushness, the intense ripe fruit was a perfect match for the richness of the pork. In comparison to the exquisite opulence of the savories, the chocolate tort was refreshingly direct yet delicious. 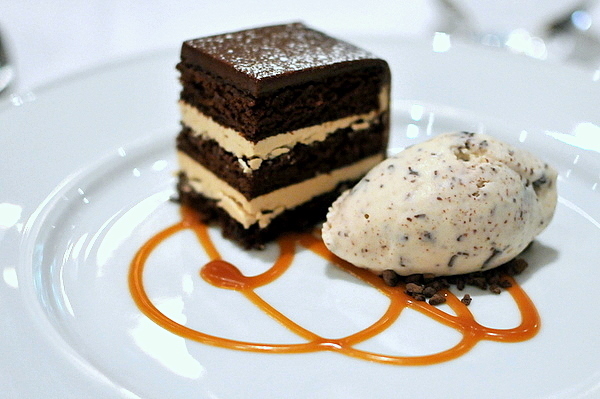 The layers of rich decadent chocolate are broken up by the expansive flavor of the caramel buttercream while the cashew ice cream added yet another layer of complimentary sweetness. Without a doubt this was the best meal I've had in the Denver-area to date, a seamless composition of elegant grace and rustic delicious flavors. You can be sure, going forward, any listing of famous French Laundry alums will include Chef Mackinney-Patterson and Master Sommelier Bobby Stuckey. I don't know if I'll ever find myself in the area, but if I am a return visit is definitely in order. Situated in Littleton, a small city south of downtown Denver, Opus flies under the radar despite having been around for seven years. 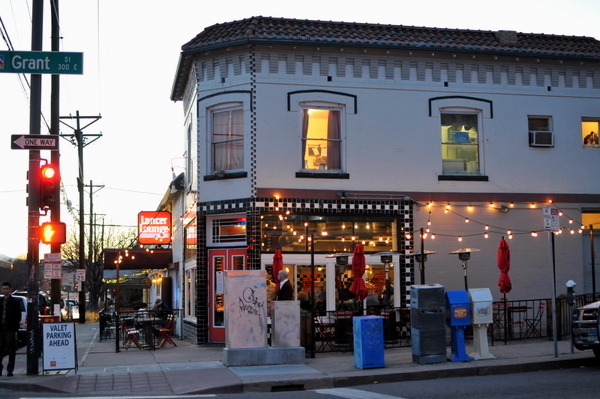 The restaurant scored the #5 rank on 5280's list of top 25 restaurants in Denver but aside from that review there was very little information on the restaurant. The restaurant offers a fairly typical menu and a reasonable 6 course tasting as well as a more luxurious 9 course tasting that comes in at a whopping $150. The exterior of the restaurant is fairly understated but that seems par for the course in the Denver area. 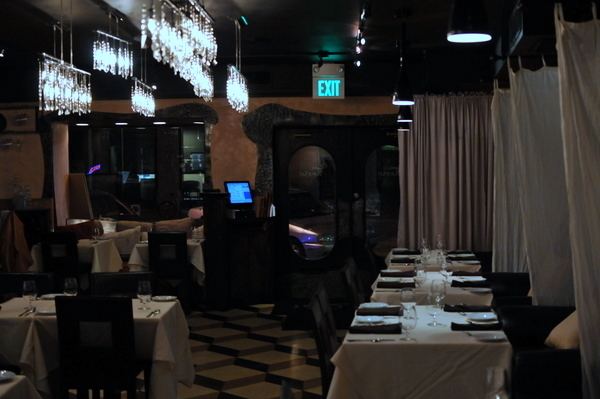 Though I'd never judge a restaurant solely on the decor, the interior gave me a sense of unease about the restaurant. 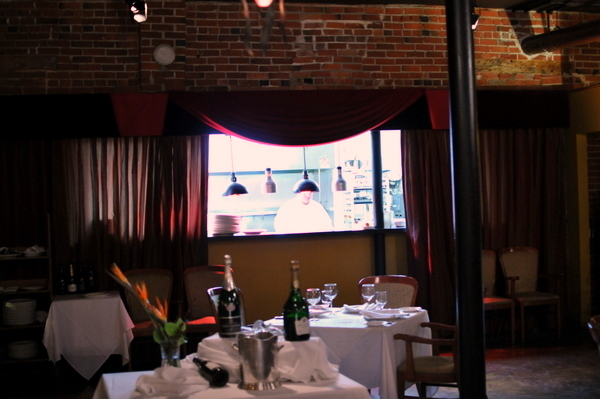 Red brick walls, exposed piping, and a velvet curtain in front of the kitchen gave me the feeling of a stage; was this place just masquerading as a restaurant? Opus had me worried right off the bat. 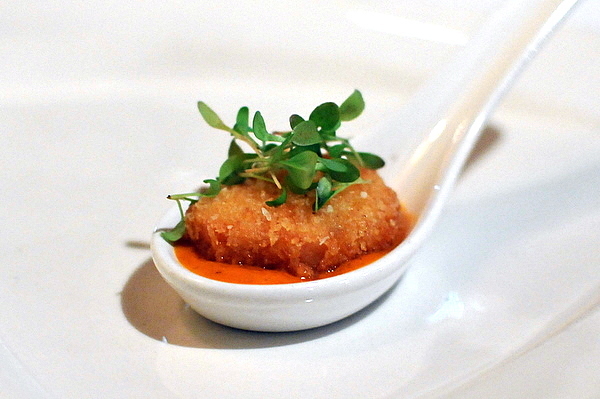 The croquette had a nice texture but a slight funk that suggested the fish was none too fresh. The tomato sauce was incredibly blunt and heavy making me wonder if it came from a can. 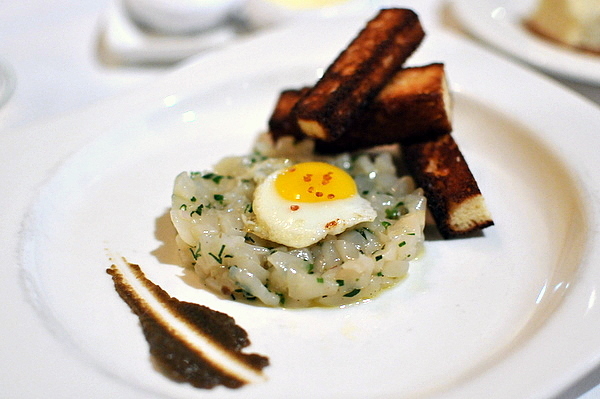 Things got better with the scallop tartare, slick fatty and nicely savory. The egg adds depth and texture while the caper raisin vinaigrette was remarkably complex highlighting the strengths of the contrasting flavors. The brioche was a bit overdone but given the rest of the dish, this was an afterthought. The wine was a sweeter Kabinett, juicy green apple with minerality and acid for balance, easy drinking but a bit on the sweet side for the tartar. 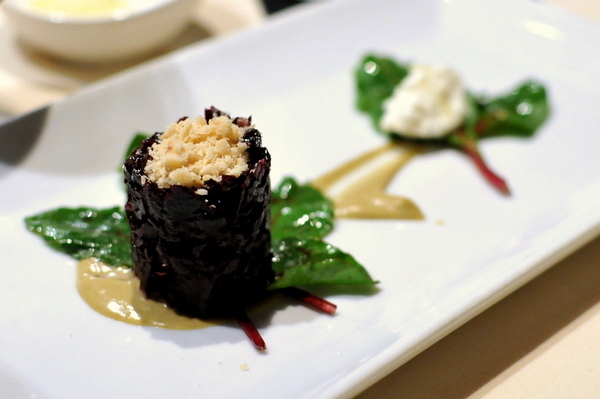 I simply cannot fathom how this dish was created; I love savory sweet but this was simply garish, some finesse please. 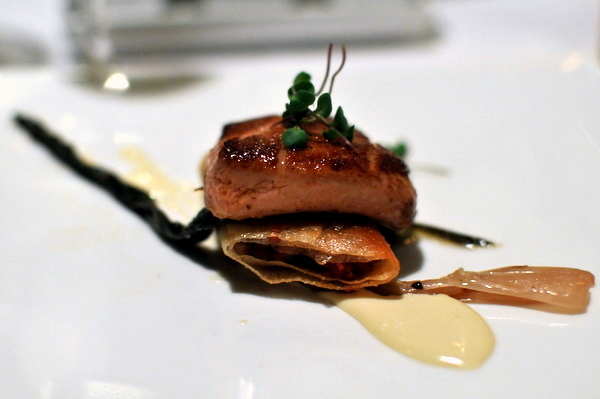 The seared foie gras was stereotypically rich and though the demi glace felt like it would have been better suited to a steak at least its potent meaty sapor matched with the richness of the liver. 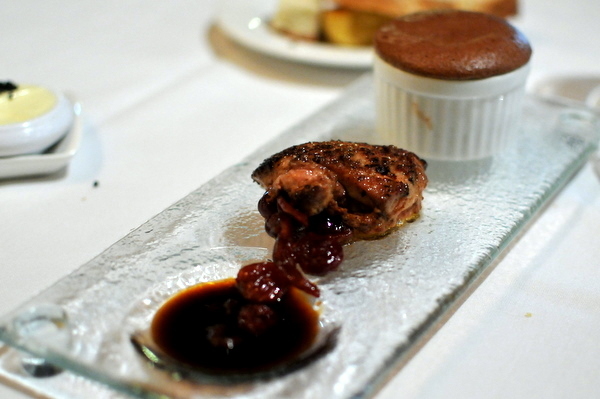 The chocolate soufflé and poached cherries were excruciatingly sweet and would have made a fairly complete if simple dessert. I could at least forgive the design of this course were it not for the soufflé was not only drastically undercooked, but the inside was still semi-frozen. The wine was a sticky sweet muscat with typical flavors of caramel and overripe plum. Mashed potatoes aren't typical signature dish material so it speaks volumes that Joel Robuchon's pommes purée remain one of his most renowned courses. 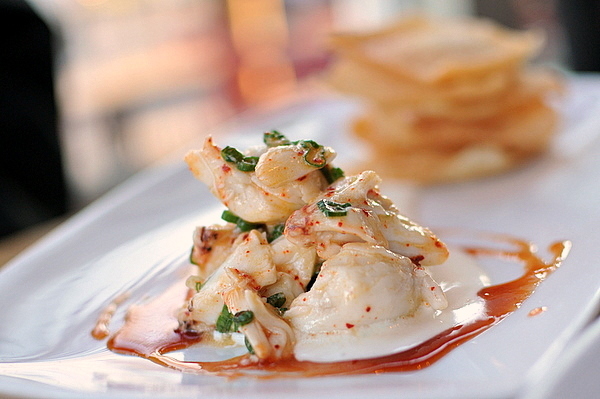 Chef McGaughey created this dish as an homage after tasting the vaunted potatoes in Vegas. Potatoes, peas, and carrots this is made from the parts of frozen dinners nobody wants. Though I enjoyed the potatoes I thought they were a bit dry; most recipes I saw online called for both cream and butter but the preparation relied solely on butter. Had this come as a side dish I probably wouldn't have noticed but on its own the small flaws seemed much more apparent. This was the one course that had some genuine promise. 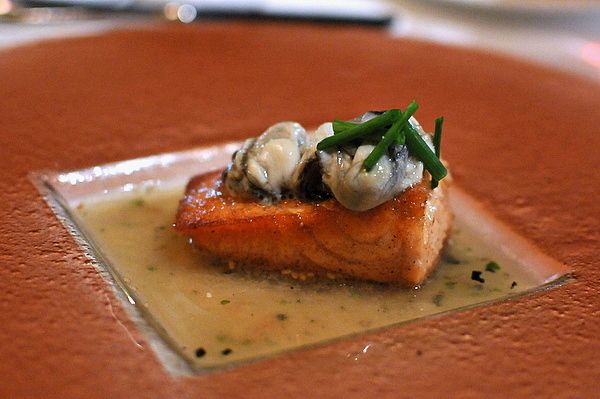 The oysters were slightly warm giving them a tender texture and a potent salinity that played nicely with the salmon. The seaweed broth was infused with excess oyster jus and was brilliant: immensely savory-sweet with a subtle undercurrent of oyster. Still the course wasn't without some flaws, the fish itself was fatty and flavorful at the center but the exterior felt dry and overcooked. 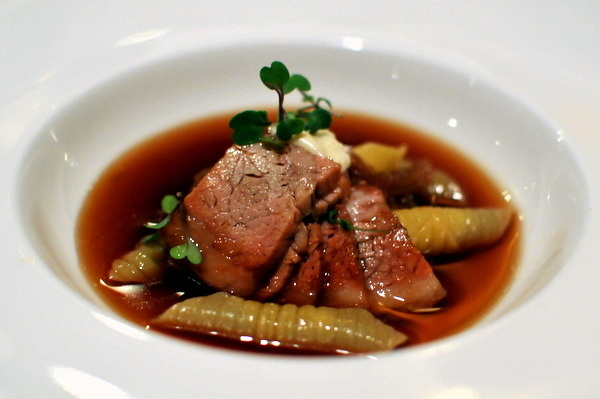 Sous vide is synonymous with tender so I was expecting this beef to dissolve on the tongue. 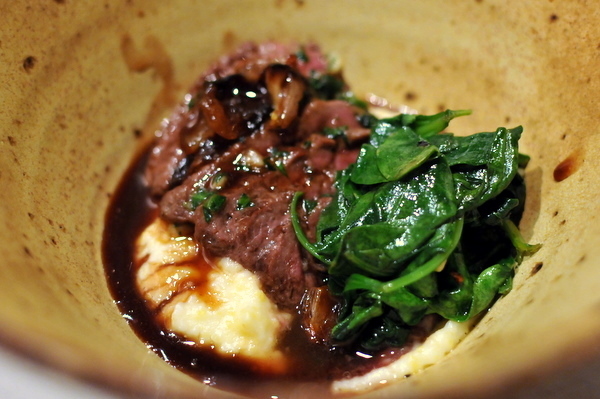 Like the salmon, the center of the beef was fairly tender but the outside felt rough on the tongue. 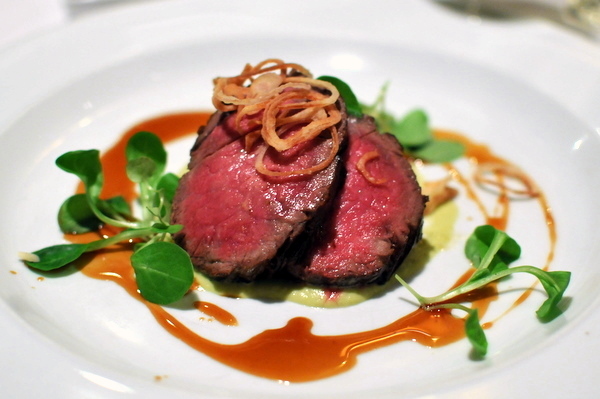 The beef was prepared simply and the herb puree added some lift to the meat without overwhelming the intrinsic flavor of the beef. I had more mixed feelings about the beans; their dense starchy heft felt a bit heavy but they provided grounding to the meat. The Bordeaux was a safe choice for the beef, but a more vegetal style might have gone nicely as a contrasting note. 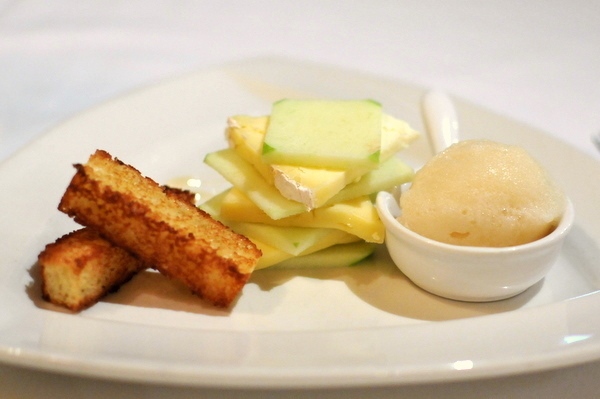 The cheese was a composed preparation with triple cream cows milk cheese served with classic accompaniments of apple and honey. Typically the cheese has a flavor reminiscent of a riper Camembert, but I detected a slight grassiness on this preparation. The wine was an unconventional pairing, the Italian Pinot Gris has an intense bouquet of wild flower as well as a shade of ripe stone fruit. 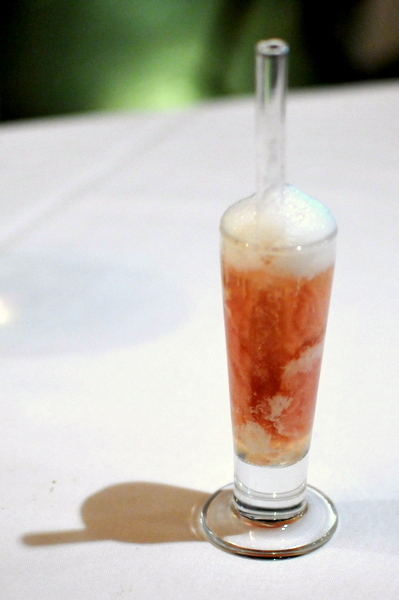 Tattinger and fresh strawberry puree, a wonderful integration of strawberry and champagne. 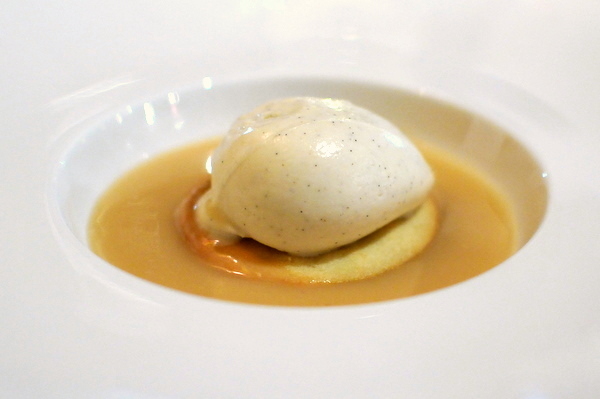 Unfortunately the puree was a bit firm which made it difficult to appreciate the duo together. With the name liquid tarte tatin, I was expecting a something adventurous and maybe a touch molecular that the staff dubbed the dessert a deconstructed apple tart only increased my expectations. Though the dessert was tasty enough, aside from the hot cold interplay between the veloute and ice cream the rest of the dish was fairly insipid. 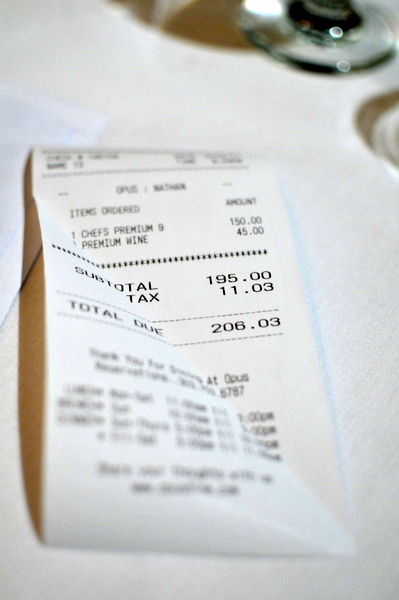 I'm not one to balk at paying a high price for good food but blunt flavors, crude juxtapositions, and technical mistakes are never acceptable and simply galling given the price. Just for comparison, Providence only charges $125 for their 9 course tasting menu and Coi offers a sublime 11 courses for $145 both of these restaurants won two Michelin stars and are among the best in their respective cities. 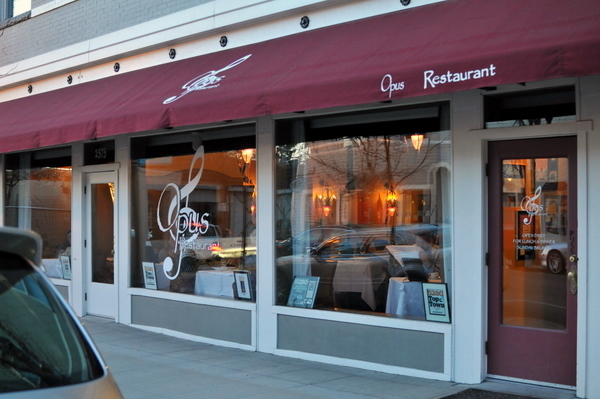 With Opus, I got the feeling that the restaurant fills a niche as the one "fine dining" restaurant in Littleton catering primarily to neighborhood residents who don't want to head downtown. 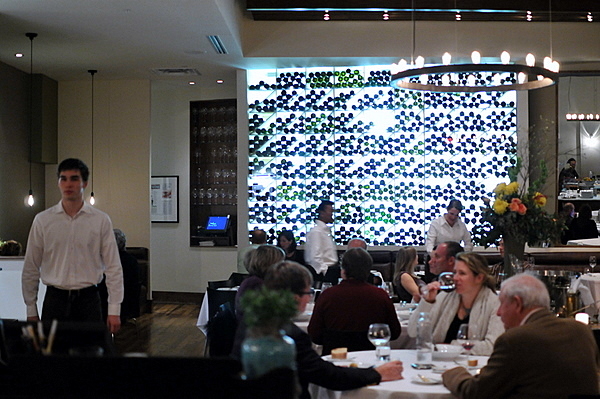 Frank Bonanno is undoubtedly one of Denver's most prolific chefs. After being pleased by my experience at his flagship, Mizuna, I was curious to check out some of his other restaurants. 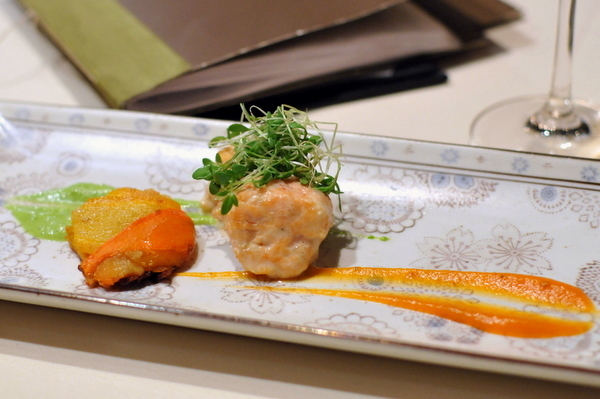 Of the remaining restaurants, Bones had the most interesting menu of Asian appetizers and noodles with European flair. The restaurant lacks the understated elegance and warmth of Mizuna, opting instead for some basic white topped tables and a long noodle bar. Bones features an interesting cocktail selection emphasizing Asian libations like Sake or Japanese Whiskey. 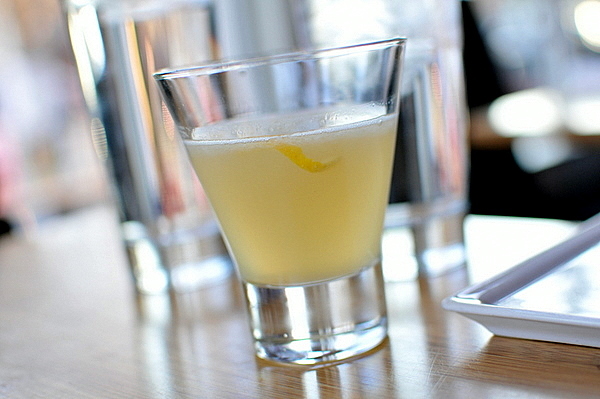 The drink lives up to its billing of simple and refreshing, an elegant whiskey sour, whiskey is just barely detectable beneath the aromatic elderflower and citrus notes. I was hoping for something more elaborate than a pile of crab and some deep fried wonton skins, but the course wasn't bad. The crab meat was sweet and plump though I wish had chosen a citrus or vinegar based accompaniment instead of mayo. 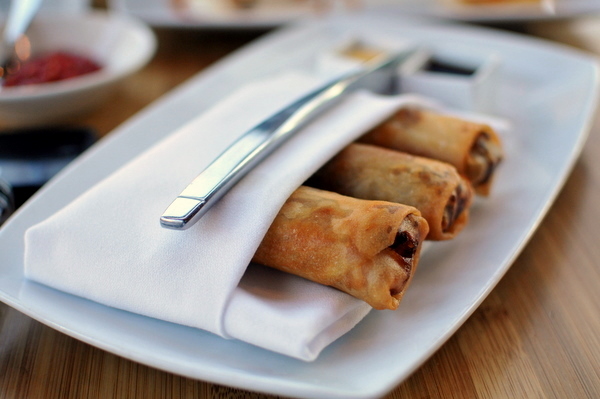 I've never been a huge fan of eggrolls but my companion was curious to try this course. This actually turned out to be one of the better apps, the duck sausage was suitably fatty and tinged with the flavor of five spice very similar to a traditional roast duck. Somehow the most adventurous of the courses was the only one that panned out. The rich spiced potstickers are filled with the classic preparation of escargot seasoned with herb butter. 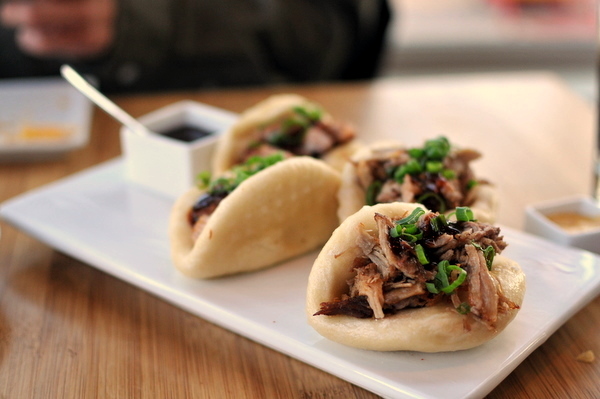 I was expecting great things with this course, soft fluffy buns wrapped around tender rich pork something like the Peking pork at Cafe Hiro, but what I got was dense heavy buns and dry tough pork. 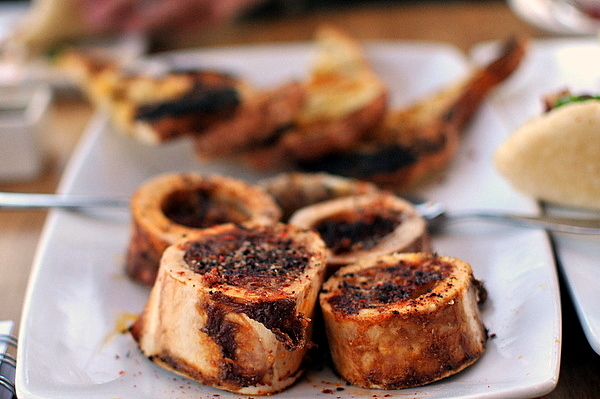 This was a fairly typical preparation of bone marrow. The texture is reminiscent of jellied fat and the marrow's gorge-raising oiliness made me feel I was eating beef flavored butter. We were given some toast to counter the marrow's weight but the bread was already buttered reducing its effectiveness. I had such high hopes for this course, rich ramen served with runny eggs sounds like quintessential comfort food. Unfortunately I was again headed for disappointment, the lobster turned out overly tough and the broth was nothing like my expectations. 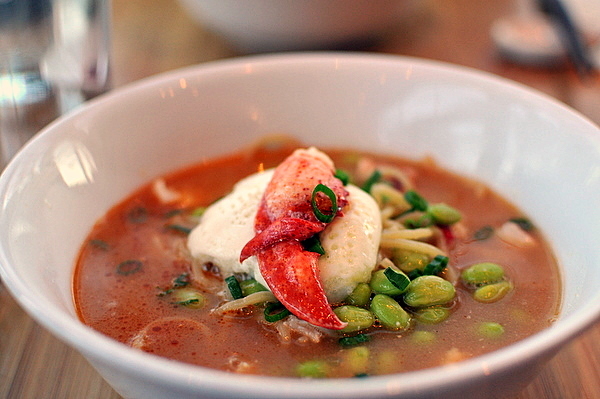 I was hoping for an intensely fatty umami soup like the traditional tonkotsu broth instead the soup was similar to a lobster bisque, buttery, sweet, and heavy. The course's one bright spot in this whole dish was the perfectly cooked ramen. Certainly I didn't expect the same level of refinement out of Bones that I did from Mizuna but the flavors didn't work out as I was hoping. I envisioned traditional Asian flavors with the Western emphasis on quality with perhaps some French or Italian influences thrown in. 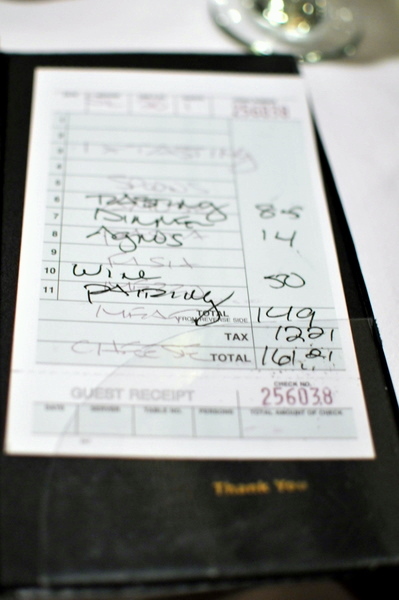 The food was fairly well cooked, but course after course of buttery, oily fare felt way monolithic for my tastes. I would have preferred some contrasting acidity or spice, but seeing as the restaurant was packed, my opinion seemed to be in the minority. 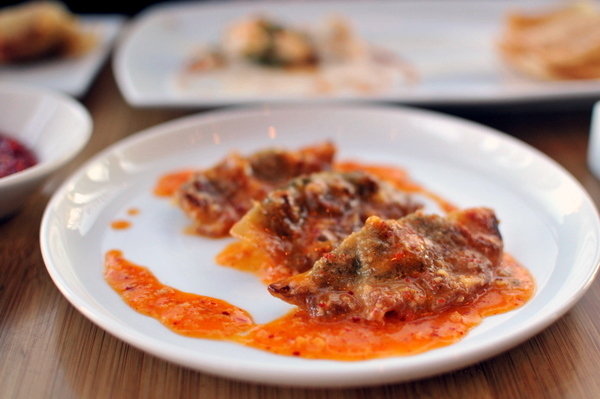 After getting a degree in finance, Chef Frank Bonnano returned to his first passion, food. Prior to opening his own restaurants, Chef Bonanno honed his skills primarily at the side of Mel Masters, as well as with stints at The French Laundry and Gramercy Tavern. Since then Chef Frank Bonanno has created what is arguably Denver's most successful restaurant empire, with the crown jewel being Mizuna. 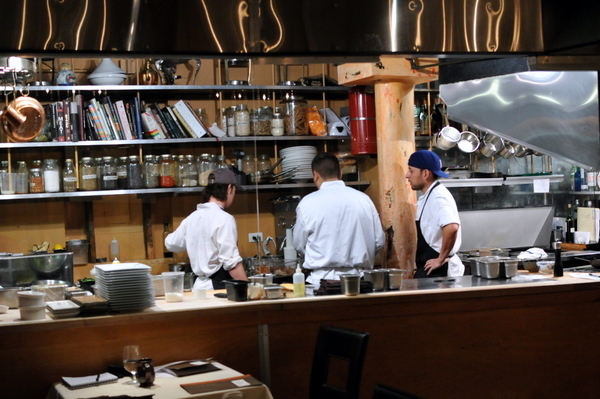 Opened over 9 years, ago Mizuna was tied with Restaurant Kevin Taylor for the top rating on Gayot when I first visited Denver back in 2007 and 5280 rated it as Denver's second best restaurant. This was definitely more bourbon and less lavender sour, the stiff woody heat leads to a tang on the finish, pity that the lavender was lost. Part pasta part french onion soup this was perhaps the most sublime and flavorful veal I've ever eaten. The meat comes with a fatty trim and deep meaty flavor heightened by a complimentary savoriness from the caramelized onion and melty Gruyere. The chardonnay opens with a honeyed nose that devolves into light citrus threaded with a stony smokiness. Despite having some doubts about this course , but I couldn't refuse the siren's song of truffle risotto and poached egg. 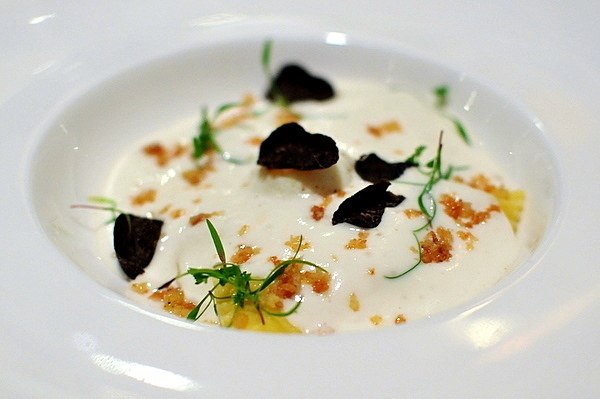 While the egg added a lovely textural component, the course proved to be fairly one dimensional with the decadent creamy cheese dominating the palate. The fish was cooked just enough to cause it to flake under pressure but not so much that the meat felt dry. The vegetal puree, savory potato, and crispy leeks were fairly prototypical accompaniments, but the flawless execution still made this course a joy. Despite being a lighter course, the paired pinot was heavier than the Burgundy paired with the foie; fruit driven with a darker fruits and a thicker silkier texture. Another simple but well executed course. 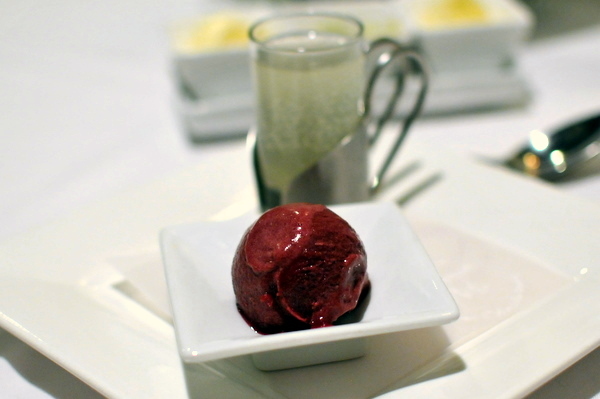 The blueberry sorbet was intensely saccharine despite not having any extra sugar added. The weight of the ripe dark fruit is balanced by an incredibly pure note of lemon. The final savory was a straightforward strip loin; nothing groundbreaking but like the last few courses the course was well cooked and thoughtfully designed. The accompanying wine was well matched to the beef, elegantly balanced, the fruit is kept in check by tobacco and earth as well as minerality. 2009, Michele Chiarlo, Moscato D'Asti, "Nivole"
The dessert felt a bit lackluster, the panna cotta was a touch firm and to be frank quite vanilla. 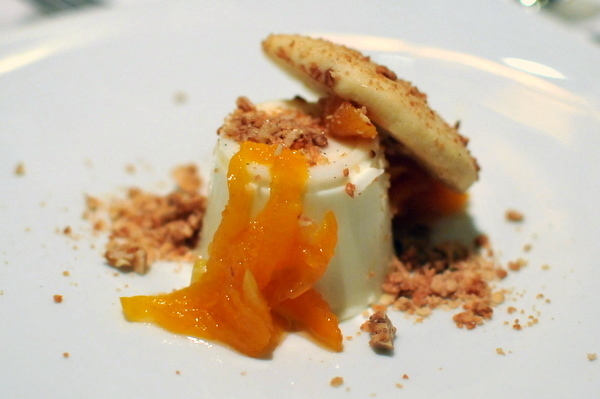 The macerated apricot needed more pop and potency, the jammy flavor might have offset the blandness of the custard. Thankfully the paired wine had some life to it, a classic Moscato D'Asti, bubbly floral and sweet. 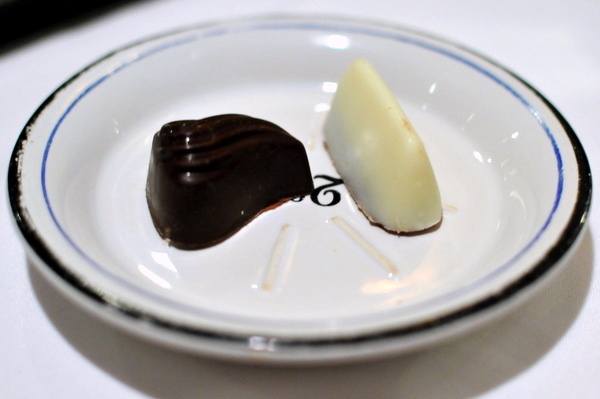 The chocolates were a nice change from the lackluster dessert. The dark chocolate had a flavor reminiscent of a Klondike while the white reminded me of a snickerdoodle. Despite billing itself as a food laboratory where chefs are free to experiment, the style of food at Mizuna is fairly ordinary. 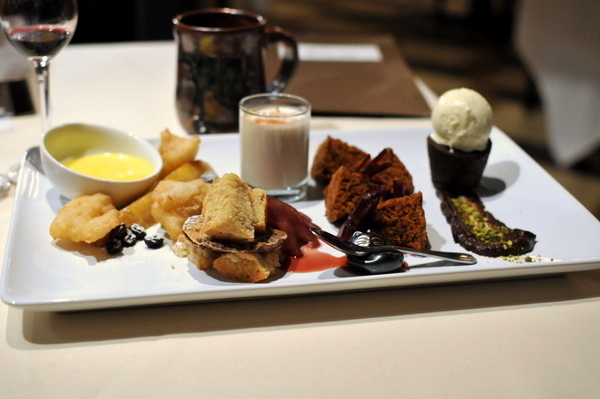 That is not to say the restaurant is lackluster; where the restaurant does shine is in execution, using time honored combination and high quality ingredients to craft delicious cuisine in a warm inviting neighborhood restaurant. If you are looking for Denver's answer to Jose Andres, keep looking but if you simply want some good food come to Mizuna. 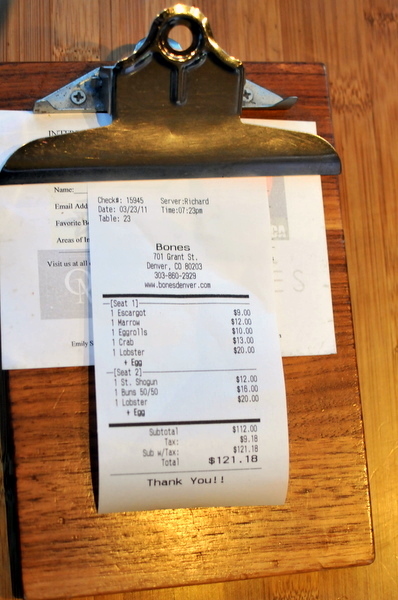 The whole farm to table trend at restaurants is nothing new, but how many of those restaurants can claim to own their own farm. 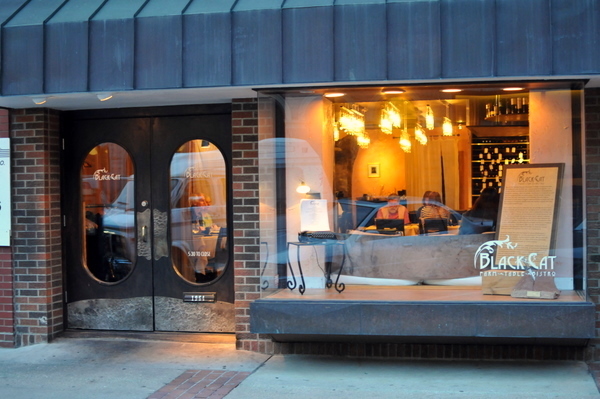 That is the premise behind Chef Eric Skokan's Black Cat Bistro; farmer by day, chef by night, he raises free-range chickens, ducks, and hogs as well as a selection of 250 heirloom and heritage vegetables. By controlling the whole supply chain, Chef Skokan can select only produce at the height of freshness then tailor his menu to match. 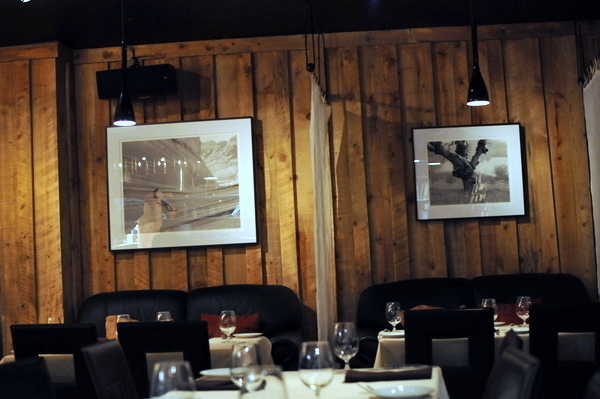 With neutral color wood boards and warm furniture, the restaurant has a rustic homey feel like dinner in a log cabin. At the same time the restaurant features a brightly lit display kitchen which suggests the staff is comfortable showing off their skills and letting diners see the action for themselves. I'm always worried about eating raw fish in a landlocked state, but this was impressive. The fish was tender and fatty, lending itself well to the twang of the fresh lime. The weight of the cheese paired surprisingly well while the greens added a zesty vegetal accent. The wine was a citrus and fruit driven Chenin Blanc with a bit of yeast on the finish. 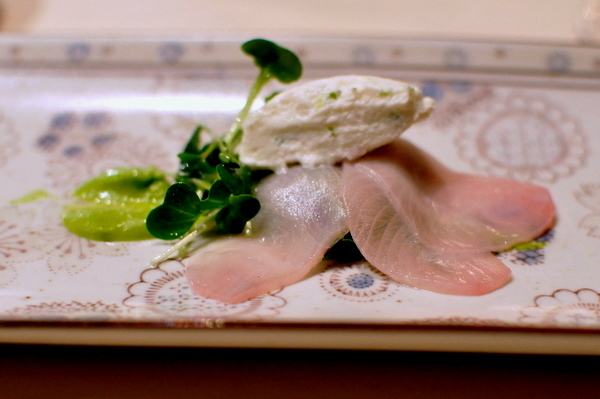 The astringent attack went well with the lighter flavors of the hamachi. I tend to shy away from beets, their rich body and saccharine flavor are just too cloying. On their own the beets were overly heavy but the accompaniments were quite effective in tempering that root vegetable sweetness. The goat cheese was a ricotta made by Fruition's farm that lacked the typical gamy funk but had a delightful creaminess. 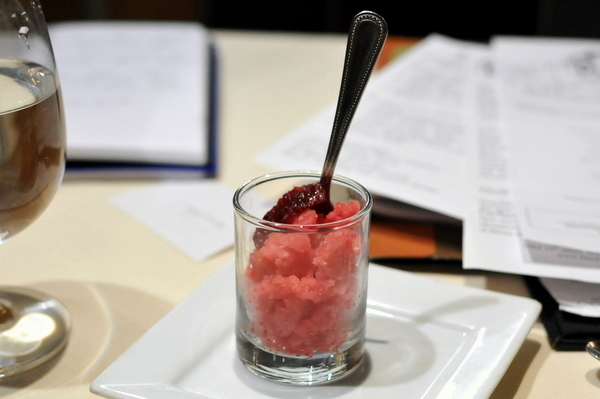 The pepita puree was a very mild preparation of the seed while the greens were immensely fresh and zesty despite being very different both accompaniments went nicely with the beet. The wine, a medium bodied Gruner, had the typical bright minerality as well as a sufficiently lush mouth feel. Like the previous course, I was a bit apprehensive about the heavy reliance on root vegetables but I've come to realize the kitchen does very well with their produce designing courses to show off the flavor of vegetables picked at the height of freshness. Turned out the fish was actually strong enough to stand on its own with a robustly savory body. The carrots are incredibly light and nuanced, adding a levity and vegetal counterpoint without the overly sweet flavor. The wine was a Sauvignon Blanc from Marlborough. Though I typically disdain Sauvignon Blanc, this was surprisingly good, juicy tropical aromas of passion fruit and lychee add complexity without being cloying on the palate. I've never cared much for Brandade and this was fairly typical, salty and fishy with a mealy interior and charred crisp exterior. 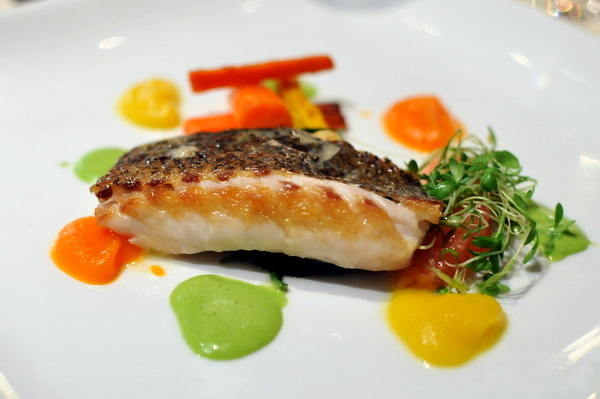 Again the effectiveness of the fresh vegetables was apparent, in the Puttanesca or "whore" sauce, the intensely acidic flavor helped balance the potency of the cod fritter. The wine was from a Greek producer Argyros and featured a grape I hadn't heard much about before, fairly rich with a nice fruitiness the wine balances nicely adding softness to the acerbic sauce. Up do this point the kitchen had been doing so well, offering thoughtful and well developed courses. Having had some superb curries recently I was hoping this would continue the trend. Unfortunately the rock shrimp paste doesn't do justice to the shellfish's natural flavor or texture. Further the coconut felt a bit muted and thin where a a heavy heartwarming spice might have helped balance the shrimp's lightness. Somehow the most savory thing on the plate was the carrot gratin but as always the fresh greens were on point. The Binner was a blend of three sweeter grapes and the resulting wine showed off notes of crisp apple cider, sweet and lush with enough acid to keep things lively. 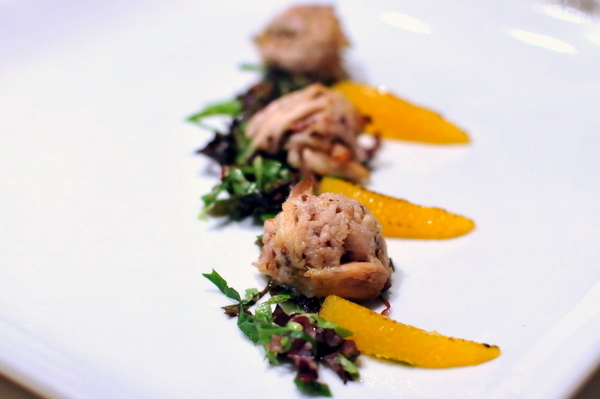 Deliciously tender rabbit, served slightly warm, the natural savoriness is augmented by a light hit of mustard. The salad is tinged with a distinctly Asian flavor that imparts a flavor reminiscent of Peking duck. The appearance of a red wine was quite welcome at this point. 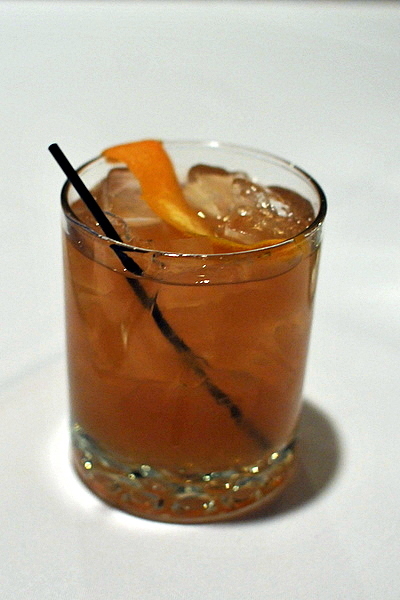 The flavor is immensely rich and ripe notes of concentrated berry with some alcohol. My waitress boasted that Colorado has the best lamb and this course was a fairly convincing argument. 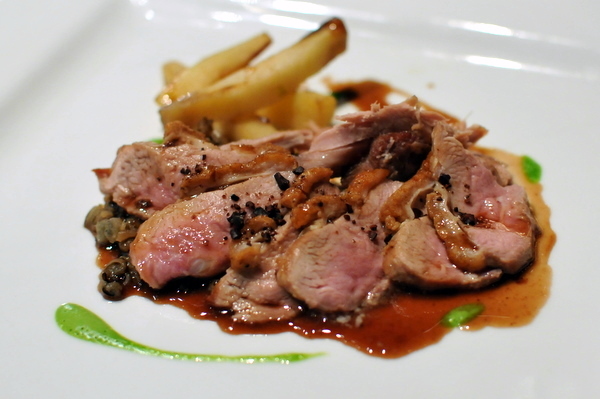 The lamb was silky soft, rich and rustic and accompanied by equally straightforward yet effective sides. This was paired with a deep weighty Rhone, the nose is laden with dark ripe cherry and berries but the palate is substantially lighter, with a bit of mocha, spice, and earth to balance the fruit. 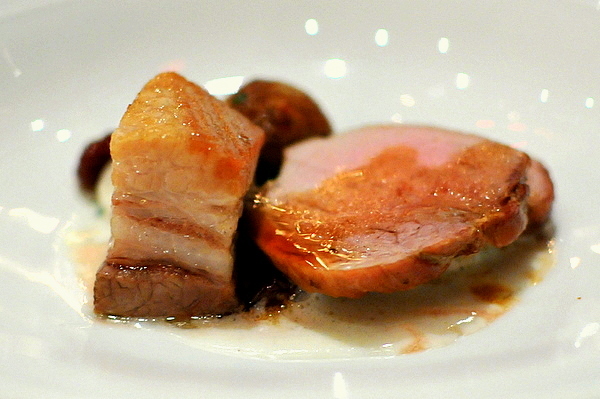 The final course was a duo of duck, confit leg and seared breast. The rosemary jus was superb, but by this point I was too full to enjoy the extra starches. The last wine was a red from Bergerac, about 75 miles from Bordeaux, a classic red blend of merlot and cab, the wine was bigger than the typical Bordeaux, the classic red fruit and cassis is balanced by warm aromas of tobacco and herbs. The meal transitioned so suddenly from light vegetable driven flavors to heavy savory meat, leaving me incredibly full. The multifaceted acidity of the granite was the perfect way to revitalize the palate. 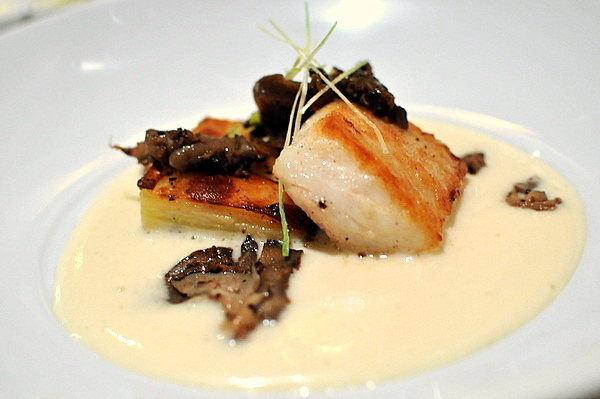 Chef Skokan and his staff make excellent use of the bounty their captive farm provides. Flavors all around are on point and effective. The freshness of their produce was on full display with the seafood courses, bright lively and expressive the vegetables were at least as impressive as the meats they were paired with. The latter three savories were much heavier but the quality of the meats justified their greater prominence. 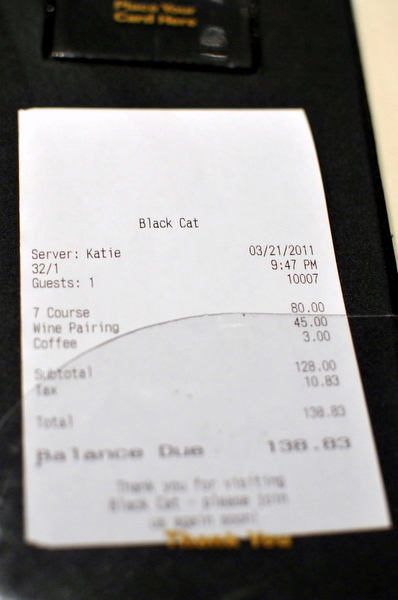 The restaurant was a bit out of the way, but Black Cat Bistro was well worth the trip.